James Rosenquist's "F-111" is so familiar by now that memory has begun to smooth its shark-tooth edges and recall the Cold War period it exemplifies with nostalgic sighs. For some of us it's hard to recall a time when this wicked satire of the U.S. Miiliatry-Industrial-Consumer Complex was not around. A controversial hit when first exhibited almost half a century ago, the painting was quickly designated a Pop Art icon in textbooks. Students have been parsing its candy-colored tapestry of incongruous image son art-history quizzes for decades. What's jarring about its current installation at New York's Museum of Modern Art is that, until now, museums may never have done justice to the piece. That's reason enough to visit the fourth floor, where until July 30 the 86-foot-long behemoth can be seen as Mr. Rosenquist introduced the painting in 1965 at the Castelli Gallery in New York: a four-sided, wraparound mural for a space (23 feet by 22 feet) little bigger than a squash court. In the current MoMA installation, however, the violence isn't so easily laughed off. Bent around the four walls of a tiny space, the piece now offers uncomfortably little area for the visitor to step back. The confinement is menacing. Being forced to look at the mural from a few feet away is like examining the X-rayed stomach contents of a giant anaconda, one that has slithered its way into your dining room and is flexing its coils. The aggressive, cynical maleness of the piece is almost overwhelming. The silhouette of an F-111, the most advanced jet aircraft of its day, runs the length of the work and is painted on 23 aluminum panels. This high-tech material supplies the undercarriage for the images and is in some ways inseparable from them. Our eyes are asked to run along the shiny metallic skin. Pop Art is permeated by ambiguity toward the bounty of America's consumer society, and Mr. Rosenquist's attitude is no different. He just amped up his mixed emotions in a work of unprecedented size and complexity. (Its gigantism reflects his training in commercial art, painting billboards above Times Square during summers in the early 1950s.) As with Warhol, the visual language inserts images from magazine advertising and journalism into a re-edited commentary on the culture at large. David Salle and Barbara Kruger are but two artists who in the 1980s adapted these photo-mechanical techniques to make large paintings as combative as "F-111." New Wave cinematic rhythms for images on this scale were unheard of in 1965. Read like a strip of film, they are connected by jump cuts instead of clear transitions. The central figure (and the only human) is a smiling blond girl, a figure lifted from a 1950s Saran Wrap ad. Wearing lipstick and with her hair in ribbons but inside a hair dryer, she's a child aspiring to sophistication beyond her years. The machine on her head is also a jet engine—cone-shaped, blasting heated air, made of reflective metal—and may be sucking her up with a force she is unaware of. Knowingly or not, Mr. Rosenquist may have woven her into his design under the influence of the so-called Daisy television ad. Broadcast in 1964 only once, but analyzed widely while "F-111" was being constructed, that notorious attack by Lyndon B. Johnson's political team on Barry Goldwater as a dangerous extremist operated on a similar sneaky level to make its point. It, too, featured a fair-haired girl and a nuclear explosion. Standing in a field, she counts the petals she is pulling off a daisy. Suddenly an anonymous voice interrupts her and starts counting down to zero as the camera narrows to her eye. The screen then fills with a mushroom cloud. Created by media guru Tony Schwartz, the Daisy ad never mentions Mr. Goldwater. It ends with a written message: "Vote for President Johnson on Nov. 3. The stakes are too high for you to stay home." 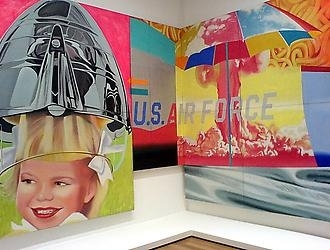 As in advertising, the images within Mr. Rosenquist's panorama act on us subliminally, not logically. Other meanings that were elusive before are harder to ignore in cramped quarters. The spaghetti in tomato sauce, which dominates the right side of the mural, no longer seems merely to represent an unappetizing meal out of a can typical of the American diet in the 1950s and '60s. Viewed up close, the strands of pasta are alarmingly squirmy, like maggots or spilled human intestines. MoMA has restored some of the shocking energy that "F-111" must have had in 1965. (Curiously, the dead spots in the work are also easier to detect; Mr. Rosenquist never quite figured out how to make it turn the corners at the Castelli Gallery.) It's still hard to accept the mural as an antiwar statement on a par with "Guernica," a comparison the artist vainly invites. Then again, he was addressing the escalating madness of Vietnam in the 1960s, not the destruction of a Spanish village in the 1930s. In retrospect, he may have created the first (and only?) psychedelic masterpiece.